Lessons start on the week of September 3, 2018 and end with a recital on December 15, 2018. Enroll by January 28, 2019. Lessons start on the week of January 28, 2019 and end with a recital on May 25, 2019. 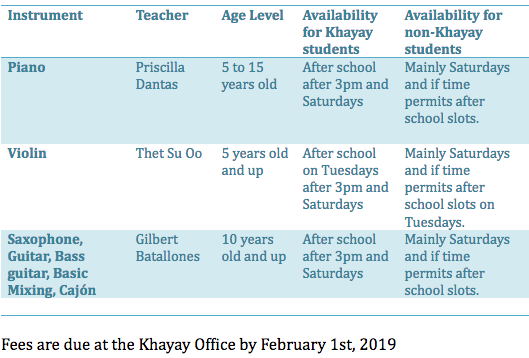 - If you are a currently enrolled Khayay student, apply through the newsboard access and the afterschool coordinator. Check the course offerings and see if you meet the criteria. Call and inquire at (+95) 9784289012 or josephsmithmusiccenter@gmail.com. It is usually faster to call. You will be notified of your day and time of lesson by your teacher before the start of the semester in due time. Attend the first class, you will receive your teacher's studio policy and attendance calendar to follow. ALL STUDENTS MUST BRING THEIR OWN INSTRUMENTS TO CLASS.